The following new development definitely relates to last point in the list. With 4.3 Magnolia CMS will sport yet another new feature – the Magnolia Store. The store will allow Magnolia users to check which modules are installed locally, download newer versions of these, download additional modules and view what is happening in the larger Magnolia community. Below is a first wireframe. One of the reasons we want to provide this feature directly in AdminCentral is that today, the information which modules are available is maintained in too many places – at Magnolia itself, we list modules on the wiki as well as in the official documentation site. It would also be nice to have that info on the corporate site. Then some of the info is stored directly inside the module descriptors. Finally, contributors typically maintain that info on their own websites as well. 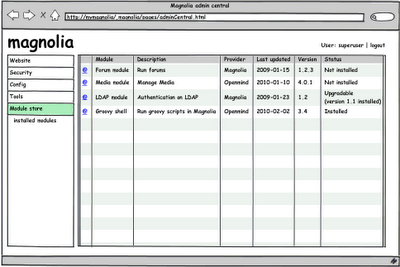 The Magnolia Store has been developed together with OpenMind (as you can see, the community is already hard at work) and will initially be hosted and maintained by Magnolia. 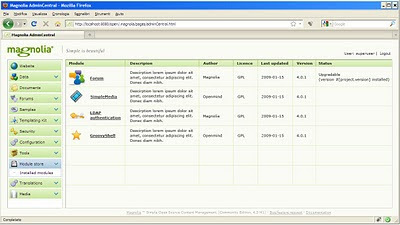 It is implemented using Magnolia CMS. One of the ideas is that anybody who submits modules for the store will be able to get an RSS feed that allows him to to embed only his contributions on his own site. Being server-side, we will be able to extend and modify the store's contents even after it is released. It will also allow us to track which modules are most interesting and add features like rating or commenting. Most of all, it should make the available modules more visible and motivate community members to contribute existing Magnolia modules. Besides showing available modules, the store will also act as yet another communication channel, this time directly with the community. We will use it to announce available training sessions, new blog posts or anything else that the community might be interested in. Eventually we will also directly support commercial usage of the store; for instance to sell modules or training. Right now, our main goal is to show you which modules are already available and provide a platform for our community to show their custom Magnolia extensions. We are looking forward to see you join in and add your contributions!